Considerably cheaper than belt too, if it works long-term. Harder to splice, mind but at least no hand-moulding of gears for the Z axis would be required. Extruder thread got filled with plastic/oil paste. Had to ream it out by hand, so I've not got the driver board done tonight. I may have overdone the oiling. I'd wondered whether something like that wouldn't eventually happen when Chris started talking about oiling the filament. For low load transfers, we've used conventional stranded beads for years, the common fabric store beading (used for weddings and table edgings, etc) has enough tensile to easily handle continued use, even at high velocity. You can obviously make your own long-loop closed circuit with a custom beading mould and high tensile wire/fiber, and there are other industrial products that have shaped "wire" which is designed for custom toothing or beading. 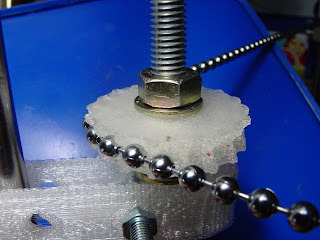 The bead runs also make for very effective automatic transmissions, load dependent jumps (similar to bicycle gears but based on "catch" structures rather than extending teeth) and will automatically select the proper loading for the system if you design the spindle correctly. Given we have always tracked colored balls in realtime for all machine calibration and control systems, obviously beaded transfers work quite well. Yes we have used a 3d torsion clutch using a similar system, however the required design "complexity" is too high for common understanding, so its not common in the educational programmes. Ratcheted bead grips (clutch) are easily constructed with identical materials, your ball-link retail lines as well as fiber/stranded beads are compressible, meaning they can be compressed into spaces for sphere:sphere density (like onloaded clutches) and obviously extend to their full spacing or any intermediate surface mounted position. Though direct drive transmission is effective, to preserve your compatibility with infinite scope constructions, Id strongly suggest using a geared/ratcheted system for your lifts/transversals that can handle any loading requirements. The common cotton thread beads from your fabric store can handle upwards of your human's breaking strength tensile, are easily recovered (fragmented bead replaced) and can be stacked for high load uses. There are designs for directional and ratcheting "bead" arrangements, typically not spherical, which can control multiple independent devices simultaneously and synchronously. Pattern sequencing and multiple device scripting can be easily handled with a single strand, guaranteed synchro, where each device has a different affinity. Similar but less complex to implement and far more effective with your materials than tooth patterns or higher complexity 3d stranded forms. You might not even need a camera: a photodiode in the right position might be good enough. Also, the splice bead will probably be of a different material...perhaps one could mix in something magnetic etc. for even lower-tech detection. We actually use nothing EXCEPT spheres for all mechanical calibration and tracking systems. No electrical circuits outside of the master control (pneumatic pump/etc)..
One cell phone controls everything. Camera Phone -- IRDA(bt/802.11/usb/"docking"/headset mic/ears etc, even rewire its lights/audio depending on signaling speed) -- isolated(irda) -- control head (direct driven irda is suitable (parallel 8 bit), control signal is irrelevant given physical observation feedback, no signals) -- we use a 3 element pneumatic/h2o flow controller, any variety of tube/valve/pump/etc on (simplified) linear transversal with ratcheting. Rest of the system, including head control (though obviously higher res and hot heads are best packaged) is analogue pneumatic diaphragms, balls for tracking system. Total cost never exceeds 10usd for entire system for hotglue/flour/pet-1/liquid extrusions, 2 motors/actuator/etc for the controller, "squishy tube" and various spindles or pump configurations (dynamic), whatever cell phone, pda, computer webcam, etc is available (irda has proven effective in most cases depending on position of light and camera on fone/pda), and a battery on the control/extrusion head. direct parallel full h bridge at most off signal. Further reduction can go to a linear binary system where a human handles 99% of the power generation (turn spindle/pump) and a binary actuator which actuates the selected pump system in rotation. Fully geared (no electrical) is possible after system optimization when using water based (baking flour) extrusion materials over wood fire in any environment. No patents, no reprap grants and profiteering... Just full fabrication systems that every K-12 class we've worked with understands in full. In my investigations about ball/chain transmission I found that there are fairly strong plastic chains available for blinds/jalousies that also scale well. I wonder if it could be helpful to use a bigger diameter for the wheels as it should increase precision and reduce stress. I tried Repstrapping with wooden wheels and a drill using "christmas chain" decorative plastic stuff - unfortunately haven't finished it. Good to see that you did better! Has anyone thought of using a bike chain for drive transmission. They are available world wide, even in the most isolated regions of the third world, cheap and strong. Surely Bike chain is a bit over-kill? It seems to me that the ball-chain (either metal or plastic/string) is a pretty readily available and cheap option. The problem I have found is that ball chain can be very hard to come by and having broken the pulls on my curtains a pain to join. Bike chain is available from most sports stores, K-Mart, Wal-mart etc. In the third world bikes are a used for every thing from transport to power generation. Ball chain is as rare as hens teeth.